I stumbled upon the vintage Balmain today completely by accident. I saw it poking out from a bunch of crappy bags and thought it had nice workmanship, so out of pure curiosity, I grabbed it to take a closer look. When I saw that it was a vintage Pierre Balmain bag, I was surprised. I really liked it, so I purchased it. It was only $20! I haven't done much research about it yet, but from what I gather it is from the "Les fleurs de mon Jardin" collection. It was in great condition and it is very clearly a very well-made bag. The print on it didn't photograph well in my bad lighting, so I'll take some photos of it in daylight tomorrow. 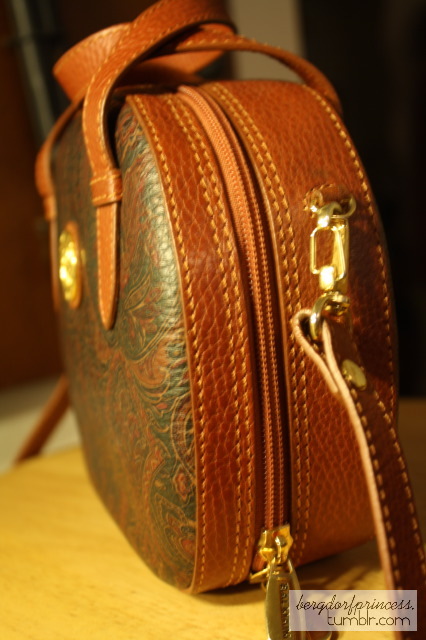 Then I purchased my second Dooney & Bourke vintage All Weather Leather bag. I love this line and I love these bags! This one has cute tassel details and very useful compartments. I love vintage bags. I think that it's so fascinating that these bags have lived through more than I have, and it's like owning a piece of history. I love history and I love fashion, so owning fashion history is pretty cool. All of these bags were ridiculously cheap, too - the Dooney & Bourke bags were $9 each and the Balmain was $20. They are more expensive if you try to buy them online (especially the vintage Dooney & Bourkes; I've seen them being sold in stores and consignment boutiques (even if they were in horrible shape) for $100-$300), so I just stick to finding them at thrift stores. I love the designs of the All Weather Leather bags, and I love my new Pierre Balmain bag (which is in immaculate condition). Plus, they can all be worn cross-body or on the shoulder, which is so comfortable. where did you find the bags? Not to sound weird, but I found you today on tPF. I saw that you got a Marc Jacobs Stam a few months ago! Why haven't you posted that yet? I am also a vintage bag enthusiast and I have found many in thrift stores around NYC. I just love it! That Balmain bag is lovely!! These vintage bags are so cute! I wish you could take me shopping!